"Worlds largest Distributors of Short Wave Receivers"
The parts listed on the schematic diagram are the ones I used because they happened to be available in the junk box. However, the value of the components used are not too critical, and can easily be substituted if not available, ^or example, potentiometer R1 mav be of any value from about 250 ohms to about 2500 ohms, I just happened to have a 500 ohm pot, so that's what I used, R2, R3, R4, and R5 may be of values from 100k ohms up to 500k ohms, and too, each one can be of a different value within this range as they are all used individually and have no interaction in the circuit. However, 1 would not use a pot lower than 100k ohms because of possible damage to the meter, and I would not use one higher than 500k ohms because the higher value makes the tuning too critical. The capacitor CI need not necessarily be a .005 but should be something close to this value at 1000 wvdc or higher. The diode D1 could be a 1N48, 1N60, 1N64, 1N6G, or some other type and work equally well Since I had a 1N34 on hand that is what I used. 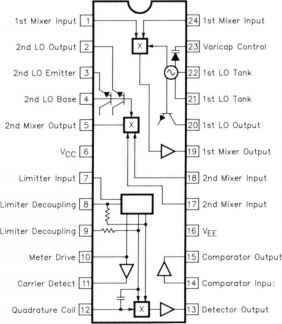 The meter Ml too, might be substituted with a micro-ammeter of some value (although a shunt might be needed) or with another milliam-meter of a different range such as an 0-3 ma or an 0-10 ma (however, it might not be possible to get a full scale deflection on a arger meter). As for the switches, it makes no difference what type is used so long as hey serve the purpose. SI is a double pole two position switch which could be a rotary switch or possibly two spdt ganged. S2 is a double pole four position switch which could also be a single rotary switch or two sp4t ganged switches, or another combination that would do the job. The Amphenol 83IR connectors are needed, but not absolutely necessary if you have some other means of connecting die input and output that will suffice. The six inch length of RG 8/U coaxial cable could be as long as twelve inches more or less if desired, but a six inch length should do fine, Also, the coax cable could be RG 11/U if a 72 ohm impedance is preferred. Now, I believe most anybody who has been a Ham for only a short time will have accumulated enough in the junkbox to find most of the parts they will need, especially since the values are no more critical, and allow for a lot of deviation from the authors own construction. It might be a good idea now to explain how to set the meter up for use. To calibrate for SVVR readings, set the fwd-ref switch to the fwd position and the power/SWR switch to the power position. It might be pointed out here that if a full scale reading cannot be obtained after adjusting R5, then adjust Îor a half scale or three-quarter scale reading and still use the same formula which will give a relative indication of the SWR which will be fairly close. Ii AMI Lir my load, set the fwd-ref switch to fwd and the power/SWR switch to the 10 watt position. Using a voltmeter with an rf probe, load the transmitter until you read 22 or 23 volts, then adjust R2 for a full scale deflection on the power meter. Using the E2/R formula you will find that with a full scale reading you are very close to 10 watts. If other than a 50 ohm dummy load is used then the amount of voltage needed for a 1.0 watt load can be determined depending on the impedance of the load being used by referring to Ohms law. The 100 watt position is calibrated by switching the power/SWR switch to that position and the fwd-ref switch to fwd, and loading the transmitter until 70 or 71 volts can be read on the voltmeter. Then adjust R3 for a full scale reading. In the 100 watt position an rf ammeter can be used instead of a voltmeter, in which case a reading of about 1.35 amps would be needed, calculated from the I2R formula, Again, these readings are based on a 50 ohm load, and if a load of some other impedance is used, readings may easily be calculated by using either the E2/R or the I2R formula. I migiit add that the rf ammeter could hardly be used in calibrating the 10 watt position as the current would be too low for any sort of an accurate reading. To calibrate the 1000 watt position the same procedure is used as for the 10 and 100 watt positions. Switch to the 1000 watt position on the power/SWR switch, and to the fwd position on the fwd-ref switch. Load the transmitter unti you read between 220 and 225 volts on the voltmeter or about 4.5 amps on the rf ammeter if it is being used. Next adjust R4 for a full scale reading. Once this has been done, all the power reading positions are calibrated and need not be bothered again. To read power all you have to do is switch to the desired position and with the fwd-ref switch in the fwd position, read directly from the meter which can be laid out in divisions to suit yourself. The question might arise as to how you can calibrate the 100 watt position when your output is only 50 watts, 75 watts, etc., or, how can you calibrate the 1000 watt position when your output is only i 50 watts, 300 watts, 500 watts, and etc.? Here you have two alternatives. First, since this meter is to be used with jour own rig, you can calibrate it to match your transmitter. If your output is 50 watts, then instead of calibrating the meter for ll>0 watts, simply calibrate it for 50 watts at full scnle deflection, or if your transmitter output is 300 watts, then calibrate for 300 watts full scale instead of 1000 watts. The voltage and current values for any given power can be calculated from Ohm's law and the power meter calibrated in any position to read a desired power at full scale. The second alternative would be to mark the meter off in equal divisions of 10, 5, or whatever you choose. If you have a transmitter capable of delivering 75 watts, figure the voltage or current necessary in order to have a 75 watt output and load your transmitter until you have reached this amount. Next adjust the pot R3 for three-quarter scale reading on the power meter in the 100 watt position and you now have this position calibrated for reading 100 watts full scale or 75 watts at three-quarter full scale, or 50 watts at one-half full scale, and etc. he 10 watt and 000 watt positions can be calibrated in the same manner if the need arises. As you might have already seen, in building the meter you could eliminate any of the power reading positions you do not need. If you wanted only one position for reading power, then the other two could be left out of the meter completely, and the one position calibrated to meet your needs. Once all calibrations have been made, the only control that should ever be adjusted is the SWR sensitivity control R5. With a little practice you will soon be able to get a relative indication of the SWR simply by switching the meter instead of using the formula. The more it is used with different antennas, you can begin ro mark off indications on the meter for permanent readings. If calibrated and used correctly, you can get fairly accurate readings of power and SWR with this inexpensive little instrument.